To check whether a cell contains the specific text, you can use the SEARCH function. This function will return the position of the first match and the #VALUE! error otherwise. Because we don’t want to have errors in our formula, we are going to use the SEARCH function with the ISNUMBER function. ISNUMBER returns TRUE if there is a number and FALSE if there is anything else. The following formula will return TRUE if there is the specific text inside a cell, and FALSE otherwise. This version is case-insensitive. If you want to use the case-sensitive version, you can use the following formula. Count cells that contain the entire text and nothing more. 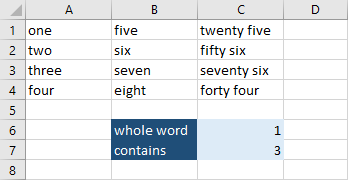 Count cells that contain the specified text. In the first example (C6), Excel will return 1 because only one cell (B2) meets the criteria. The second example will return three because cells B2, C2, and C3 meet the criteria. We can simply modify this example to copy the cell to a different column if the cell contains the specific text. Copy all the data from A1 to C4 to column A. This formula checks whether there is “six” inside cell A1. If TRUE, it copies cell A1 to B1. If FALSE it inserts a dash. Autofill remaining cells to get the following result.